...Therefore, without proper understanding of energy, it is misleading to speak of conservation of energy, because physicist’s view of world is rooted not only in a denial of perpetual motion but also in the ignorance of nature of energy itself. 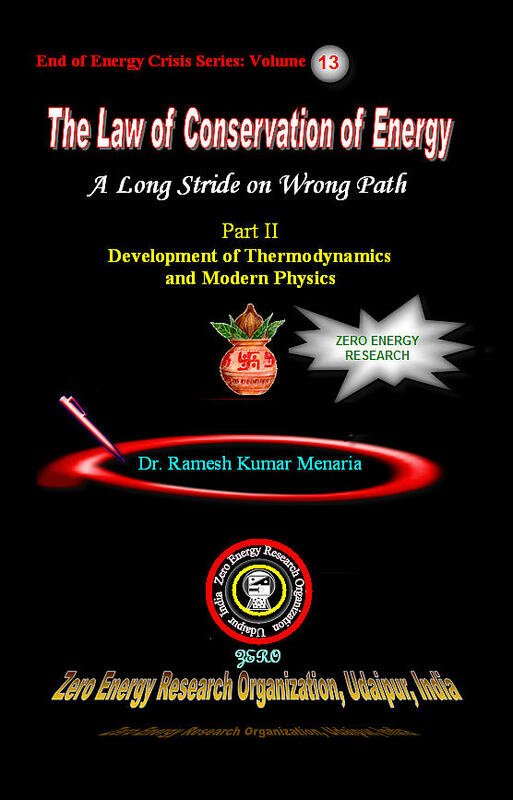 This volume deals with story of Origins of thermodynamics and erroneous establishment of laws of thermodynamics by Carnot, Mayer, Joule, Thompson, Helmholtz, Claussius, Lord Kelvin etc. ....It was erroneous to extend generalization made through experiment and observation on heat to the other parts of physics and therefore to universe. It has been demonstrated that mechanical equivalent of heat has no meaning. It is fundamental mistake to treat gravity as a mechanical force and employ vertical descent of objects as a standard to evolve various units of measurements of energy and work. Work done by an object over a closed path in perpetual motion system in a gravitation field is not zero. ....In universe, ordered perpetual motion is largely governed by force of gravitation at macrocosmic level and electromagnetic forces at microcosmic level, on the other hand, disordered perpetual motion is governed by heat. Both of them constitute a grand cycle of perpetual motion in which all things and processes in universe are subject to creation, conservation and dissolution. In fact, heat, gravity and perpetual motion have very interesting relationships with each other; we have explored relationship among them in more detail in volume on Rg Veda. Science has a very confined view of heat and regards it nothing more than agitation of particles. In the narrow case, the "Second Law" is really only a statement which describes the behavior of heat under certain circumstances. ....This book also presents you history of modern physics and critically examines the work of a generation of the scientist who has done harm to perpetual motion. Book demonstrates how Perpetual motion seriously contradicts famous Einstein’s equation: E = MC2. This volume also exposes limitations of quantum mechanics and particle physics. We would urge the reader to remember that all philosophy (therefore including all scientific theories) deals with the interpretations of facts, and not with the facts themselves. The facts may be true, and the interpretations false…. Is String Theory an Example of Pathological Science? or Not Even A Good Theory ? S-matrix bootstrap of the 60’s.